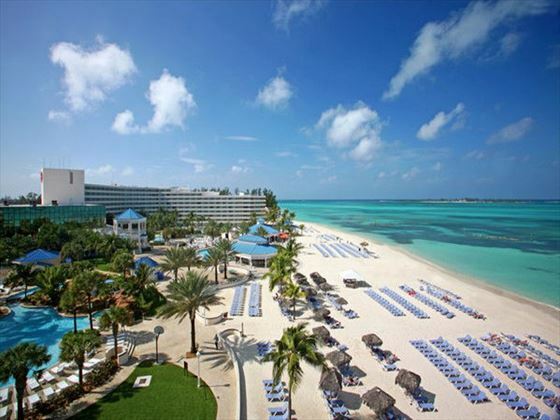 Situated on the breath-taking Cable Beach in the Bahamas, Melia Nassau Beach All Inclusive is a stylish tropical retreat. Within easy reach of the nearby shops, restaurants and buzzing nightlife, this is the perfect choice for visitors looking for fun and relaxation in equal measure. 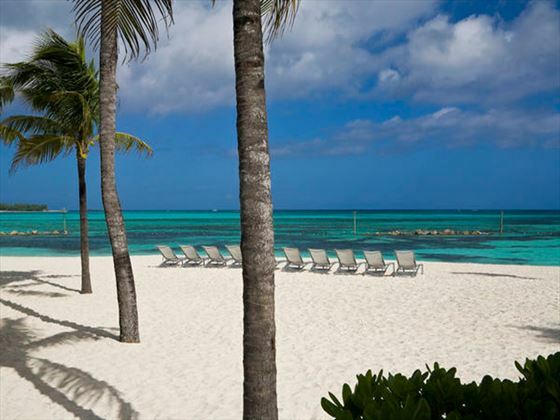 For this reason, it’s the ideal resort for families, with plenty of activities to suit younger guests and tranquil spots for adults looking to unwind. 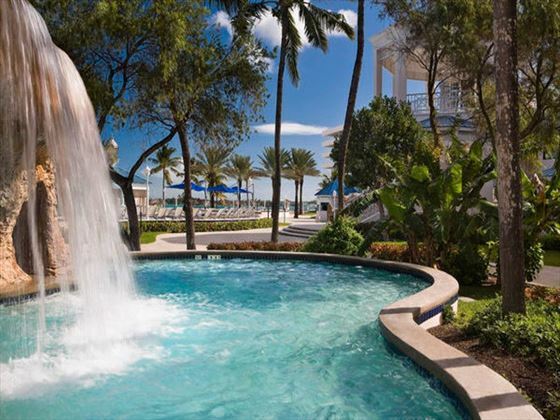 A range of pools, restaurants and daily entertainment ensures that you’re never short of things to do during your stay – enjoy the beautiful sea views and revel in the welcoming atmosphere. 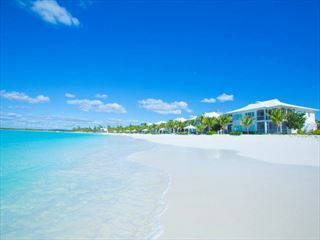 The resort is situated in the north of Nassau, on Cable Beach. 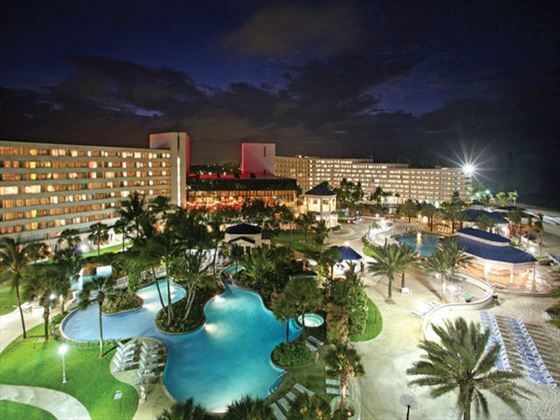 Nearby attractions include the Nassau Botanical Gardens, the zoo and the Baha Mar Royal Blue Golf Club. 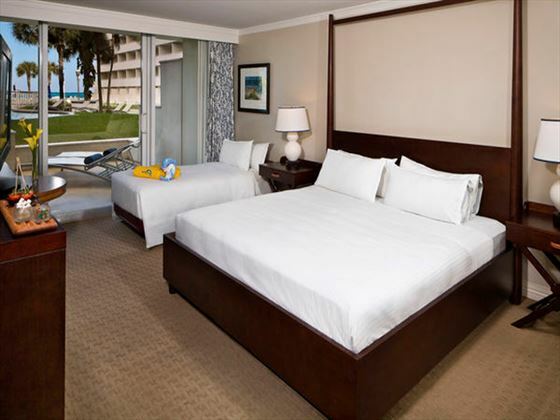 These comfortable and stylish 31sqm rooms offer beautiful, tropical views of the resort from a private balcony or patio. Delight in mesmerizing vistas of the azure ocean waves and sun-kissed sands of the beach from a large, private balcony in these strategically located rooms set on the upper floors of the hotel. These 31sqm rooms are well-appointed with stylish Caribbean décor, a fabulous selection of amenities and lots of living, lounging and dining space. 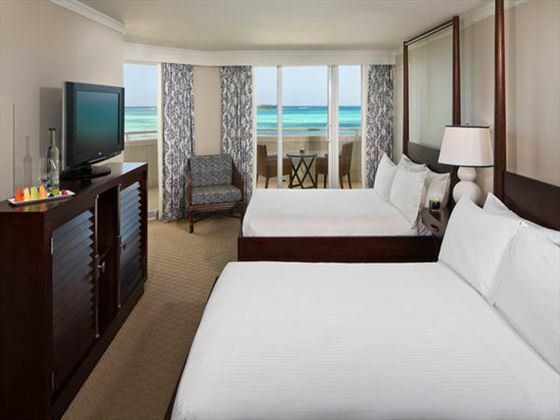 Located on the upper floors of the hotel with spectacular views over one of the world’s finest beaches, the Level Rooms span over 31sqm of elegantly furnished living space, decorated in the sumptuous, rich shades of the Caribbean. Designed to ensure an unforgettable holiday, the service in these rooms will make you feel like royalty with exclusive access to a private beach area and the Level Lounge, and a heightened level of luxury with pampering amenities and special privileges. 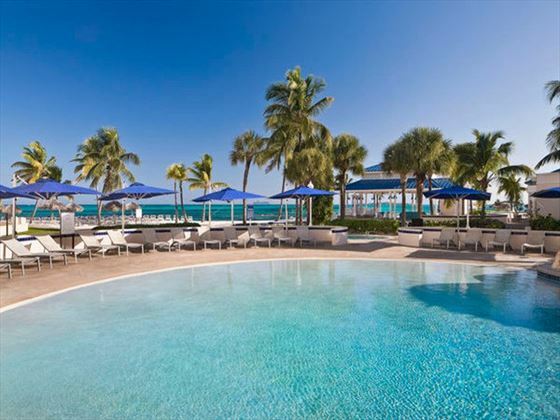 Sit back on your private balcony and feel the cool ocean breeze run through your hair as you treasure the sound of calm ocean waves lapping against the sands of one of the world’s finest beaches. Featuring a heightened level of living space, these sumptuous suites span over 51 square metres, well-appointed with Caribbean shades and contemporary flair. The suites are open-plan, designed with a four-poster king bed and plush lounge; guests staying in these rooms will also enjoy the full privileges of The Level, including private check-in and exclusive lounge access. A sophisticated and elegantly-appointed suite measuring 88 square metres in size, this accommodation is designed with the ultimate privacy in mind; spanning over a gorgeous master bedroom and separate living room, you’ll be treated to incredible panoramas over the sparkling white sand and turquoise waters, in addition to a wide selection of luxury amenities and exclusive privileges, including access to The Level Lounge and VIP services. Measuring a breath-taking 120 square metres in size, these blissful hideaways are the ideal choice for a luxury family holiday or a break away with friends. 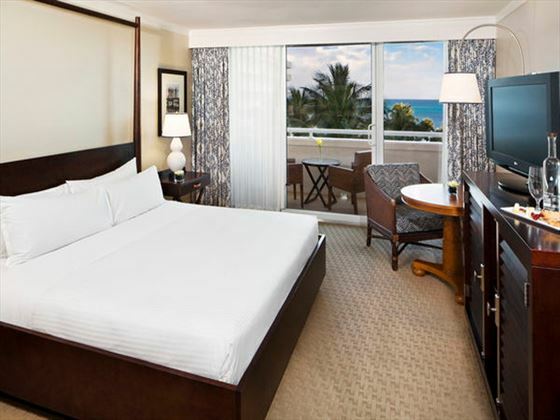 With wrap-around panoramic views of the resort and Atlantic Ocean, an extensive list of amenities and VIP Level exclusives, these two-bedroom, three-bathroom suites offer everything you may require for a home-away-from-home in a paradise setting. The resort’s ultimate choice in accommodation, these idyllic 120 square metre suites are the most opulent and luxurious category; featuring postcard-perfect vistas of the sparkling white sand and crystalline sea waters, the Presidential Suite fills the entirety of the seventh floor, and guarantees sublime comfort throughout two spacious bedrooms, an expansive wrap-around balcony, gorgeous lounge with bar and access to an extensive list of VIP services and amenities from The Level. A stylish and modern steakhouse, Black Angus serves the finest quality of prime cuts complemented by the freshest ingredients. 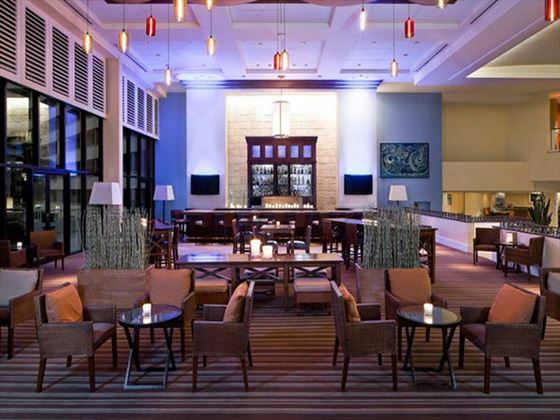 Menu highlights include Bahamian Lobster Tail, Grilled Sea Bass with Orange Sauce, Fire-Glazed BBQ Pork Ribs and Beef Empanadas with Chimichurri Sauce. Embark on a complete gastronomic journey through the classic aromas, textures and flavours of Mexico in a contemporary setting with traditional South American touches. Menu highlights include Pork Tenderloin with Braised Chard and Tequila Sauce, Grouper with Green Ceviche and Chicken Fried Tacos. A tableside margarita trolley will certainly add a festive touch to any occasion. Celebrating an exquisite blend of Japanese, Cantonese and Peruvian cuisines, Nikkei features a divine sushi bar and exciting Teppanyaki tables to watch talented chefs entertaining guests with their cooking skills. Menu highlights include a Crunchy Thai Salad, Avocado and Salmon Ceviche, Japanese Chicken Curry and Encrusted Sea Bass with Curry Mango Sauce. An upbeat tapas lounge set in the hotel lobby, Estavida serves an innovative selection of delicious tapes and a great menu of refreshing cocktails and beverages. Enjoy light bites, signature drink creations including Apricot Sangria or Gin ‘Peel’ Tonic, and a lively, energetic atmosphere through to the late evening. An ambient a la carte restaurant specialising in exquisite, rustic Italian fare with contemporary, designer décor. Select from a menu of delectable aperitifs, soups, salads, pastas and pizzas, partnered with a fine selection of white and red wines. A gorgeous, relaxed venue serving a flavourful, fresh selection of international cuisine including salads, pastas, rice dishes, vegetables, fish, meat, fruit and divine desserts presented in a tempting, modern buffet. 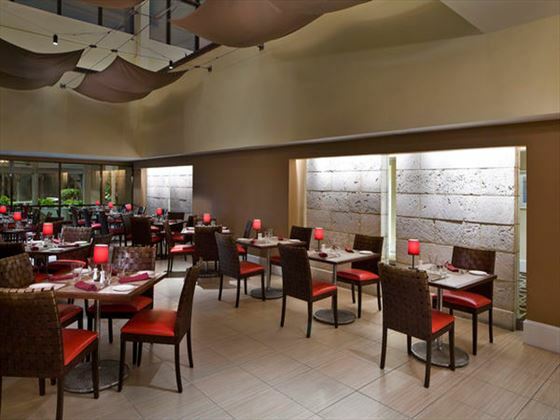 Diners may choose to enjoy their food outdoors on the terrace with beautiful garden views, or indoors with a chilled-out ambience and cool air conditioning. 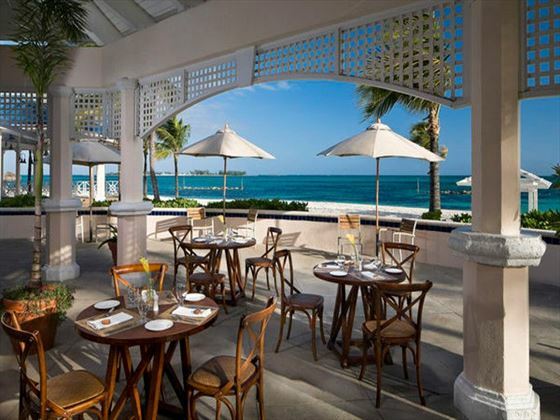 Bask in the soothing sounds and vistas of ocean waves lapping against the pristine, sandy shore as you sip on fresh Caribbean cocktails and enjoy casual beach fare in this open-air restaurant, including a delicious assortment of seaside salads and tempting light bites. Vibrant Caribbean-themed buffets are held here once a week. 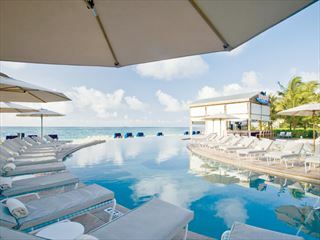 A gorgeous beachfront bar which serves refreshing beverages directly to the pool and on the beach so you won’t need to move a single muscle as you relax. 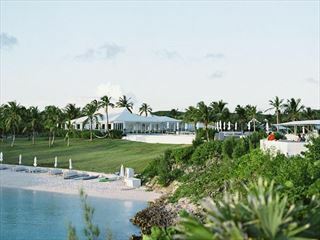 The resort is great for families and caters to kids and adults in equal measure. 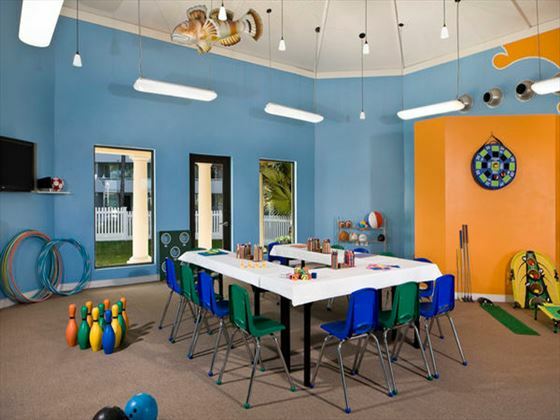 In addition to the family rooms available, there is also the option to assign a Kids & Co coordinator to help you make the most of your time at the resort. You are required to present a valid Wedding Certificate or copy at time of booking and check-in. Honeymoons must take place within 2 months of wedding date.